1 Bedroom End of Terrace House For Sale in Rotherham for £85,000. CUL DE SAC position and offered for sale with NO CHAIN involved is this spacious one bedroom end townhouse. Of interest to a varied purchaser early viewing is a must. 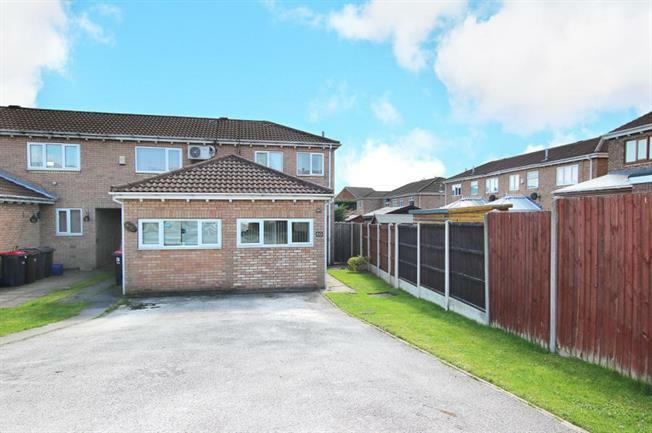 Giving access to local amenities and transport links the property briefly comprises of side entrance hall giving access to ground floor accommodation. Dining kitchen having a range of fitted wall and base units including integrated dishwasher, electric oven, gas hob and extractor. Lounge having stairs to first floor landing and patio doors to the garden. First floor landing with double bedroom with built in wardrobes and family bathroom with a three piece suite. Outside drive to the front with lawn. Rear garden having patio area and mainly laid to lawn.